A Value for $$ product that is good for removing water retention, detoxify and breakdown body fats. A little cream to be apply on each time, once a day. For a better results, to be used for 6 consecutive days and rest on the 7th day. Continue the cycle if you like. We all know that we cannot lose weight just by depending on applying creams ya? So, do remember to exercise regularly and control your diet by avoiding unhealthy food! And do remember to apply a little of this cream will do! increase slowly till you are comfortable with the sensation. Too much of it, and you will get the Hot chilli effect, which i guarantee that you wished you do not use the cream ever again~! haha. My past experiences gave me this advice that is to not to buy a product immediately from a store. You can try to apply a little on the back of your hand and see if you are allergic to the product or if the product is effective. Red Hot Chilli Slimming Gel contains several essentials easily absorbed through the epidermis helping to slim up the body. The essences are inclusive of two pure and organic essential oils, Grapefruit and Cypress, that are best known for regulating excess body fluids and eliminating body toxins; chilli extract increasing the breakdown of fatty tissue; ginko improving blood circulation and lymphatic drainage. Massage a small amount over the areas in circular movements after showering. For the best effect, wrap the cling-wrap around areas for 15 minutes. Wash hands thoroughly. Used once daily. When i first tried this product in the Sasa, i applied it on the back of my hand and.. after i got home, i can still feel the heat of the product.. so i went back to purchase the product on the next day! First night – i applied on my arms and thighs with my hands after my shower. I felt a sight tingling sensation on the areas i applied the cream. The same sensation occured even on the next day.. so i bet the product is effective! Second Night – This time round, i apply the same amount of product on my arms and thighs. The only difference is that, i rubbed it in with a roller, so that the product can be delivered deeper into the skin. After 1o minutes, i started feeling a very hot burning effect over the areas which i applied the cream and redness occured. The burning sensation were so overwhelming that i couldn’t take it, so i went for a bath again. I also tried applying aloe vera gel and sprayed my Evian Spray but nothing could ease the burning sensation. So i tried wrapping a cloth rinsed in cold water around my arm for about 5 minute and process repeated for the other arm and thighs.. Burning sensation gone. Third Night – lesser cream were rubbed into arms and thighs with the roller. Slight burning sensation. I also had “diarrhoea” once a day for the past 3 days after using the product (i am usually constipative). I believe the product is also helping my body to detoxify. 1 week after usage – arms were visibly smaller. thighs feel tighter. hi. 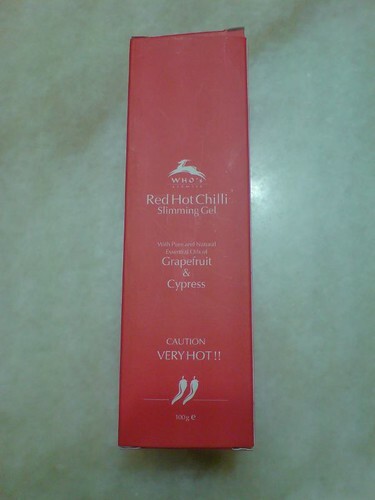 RE: Red Hot Chilli Slimming Gel..
do u know any places tat sell at a lower price? hi, thank you very much for this product. i am really looking forward to try this product. so if u plz send me some more information about this product. i was going to get it coz the sales said one of his customer bought it and she liked very much, but i kinda have sensitive skin, is it okay to apply on it? i think any product that is external is not as effective as taken internally. Thanks for sharing. I would like to try this cream. Do you know where I can get this cream in Malaysia? Can you send info to me via my email? hi i purchased mine from Sasa. Pricing as per stated in this blog. Is it still selling at sasa?? Hey is this FDA approved? Sorry for asking but I just want to know. What amount do you use to apply everytime? Is it as small as a pea or should you use more? hi, i live in nairobi- kenya. cd u please tell like where did u buy this slimming gel.is it available in my country.is it available in china. does this gel really help to flatten the tummy and make firm. please help me with ur reply. Hi sumitra, am very sorry but I do not know where you can buy this in your country..
hi its me again.what is sasa. cd u plz tell me that frm where u bought this gel. Hihi, I am really not sure where u can get it from in your country. Sasa is a cosmetic shop in Singapore and Hong Kong. hi,thank u so much for ur info. Can I get it in Saudi Arabia? Does the cream work permanently? i’ve bought d cream, and if d cream has work for me, do i still to buy more and use it in order for my tummy not to come out again?